New Zenfone series phones have started arriving with the launch of Zenfone 4 Max a couple of days back. The Asus Zenfone 4 is going to be a mid-range smartphone that is expected to arrive at the end of July as per AndroidAuthority. Today, the phone appeared on the benchmarking platform, Geekbench that revealed the major specifications of the phone like the processor, Android version, and RAM. 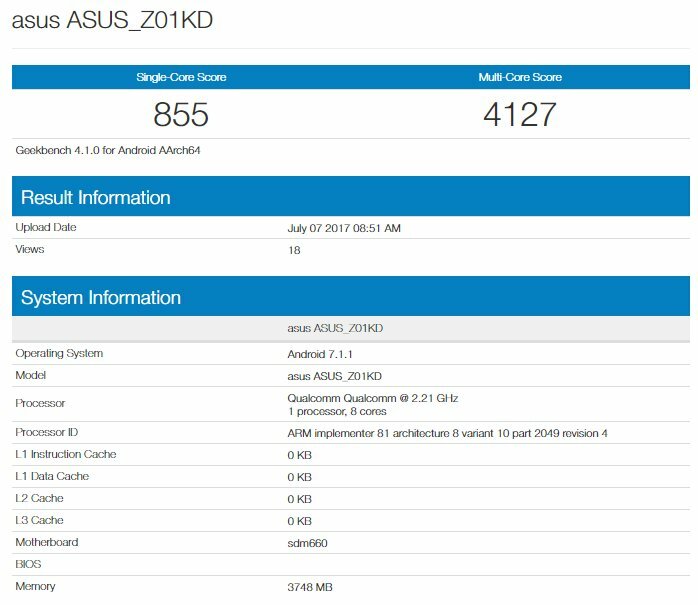 Yesterday, the phone was certified by the WiFi Alliance with model number ASUS_Z01KD, and the device with same model number appeared on Geekbench today. So, talking about the specifications, the phone is powered by the Octa-Core 2.21GHz Snapdragon 660 processor.The Zenfone 4 is running Android 7.1.1 Nougat out of the box with company’s ZenUI. ASUS ZenFone 4 = 2 versions, one with Snapdragon 630, one with Snapdragon 660. Lastly, the Asus Zenfone 4 has 4GB of RAM that is a good combination along with the Snapdragon 660 processor. Talking about the scores, the phone scored 855 on Single core whereas 4127 on Multi-core.Now, the phone is going to have two variants as per a tweet from Roland Quandt so, there will be two variants with Snapdragon 630 and 660 respectively. The one that leaked today via Geekbench is the variant with Snapdragon 660. As we all know, Geekbench listing doesn’t reveal much information about the phone, so we have to wait to get more details about the Zenfone 4. Stay Tuned.